There are rackets which really leave a mark in the market and in the heart of players. The Voltric Z Force 2 is one of them, thanks to its outstanding performance. We are used to the high-quality of the products of Yonex, like the Voltric 80 or the Nanospeed 9900, and I’m very glad to review the Voltric Z Force 2, which is for me and many others, one of the best rackets ever created. Want to discover why? Then just keep reading this review especially written for you. Ultra-fast Swings. They go fast, effortless and smooth. Tremendous Power. For devastating shots. Superior maneuverability. It outstands similar rackets in this aspect. 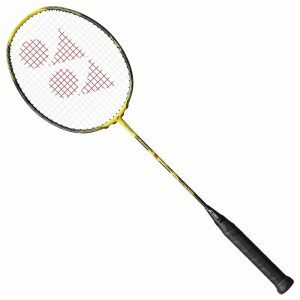 Its tremendous power for devastating shots, the ultra-fast swings and the superior maneuverability coupled with outstanding speed make this racket lethal and effective. If you are a sucker for speed and superior power, then this racket is everything you need. The technology, design and materials of it make it super-fast and ultra-powerful. Do you still have doubts and questions? Then worry not, because the next section of this article will help you to clear all of them. Yonex is known for adding cutting-edge technology to their rackets. Clear examples of this are the Arcsaber Z Slash, the Duora 10 and of course the Voltric Z Force II. The design is pretty good. The grey color accompanied with blue tones make it look sharp, elegant and modern. An outstanding shaft. It’s extra-stiff according to specs, but it’s more than that… it’s better than any other thing you may have seen before. It’s all due to the NANOMETRIC carbon technology which brings you a highly-aerodynamic, ultra-thin and super-strong shaft. This will help you to deliver stronger and faster shots. This feature is seen in action with swings. They are so fast and strong you will be blown away. If you want to enjoy of an excellent shock absorption, more power and plenty of speed, then the Voltric Z Force II can offer you that. Revolutionary Tri-voltage System. One of the most remarkable features of every Voltric racket is that they come equipped with this system that allows you to enjoy of more powerful shots and a faster swing. Another reason on why it is so powerful and fast. Tungsten Infused Grommet for superior accuracy. Want more precision and power? Then the tungsten-infused grommet along with the Tri-voltage system will retain the shuttle on the string bed for longer, so you can enjoy of better precision and more power. Created to be fast. Its aerodynamic frame puts everything inside the frame, so you can cut through the air like never before. This feature along with the heavy-head and all the cutting-edge tech found in this racket bring you superior power, excellent maneuverability and amazing speed. Now you can see why it’s such a good racket and why so many persons rave about it. Not for nothing Lee Chong Wei won his 3rd All-England with the help of one of the best Yonex badminton rackets. Now it’s time to review its performance in the game. Let’s review how well in performs with different shots. Throwing clears with the Voltric Z Force II feels like magic. No kidding, because they go so smooth and far that it looks beautiful and feels awesome. This allows you to see how the heavy head, aerodynamic construction and speed work together to bring you a superior performance. This is one of the aspects where this racquet really shines. Thanks to the cutting-edge shaft, it allows you to throw ultra-fast drives, which makes it very attractive for attackers. Once again, you can enjoy it thanks to its excellent design and aerodynamics. This is another aspect where this racket shows its real potential. You can jump and hit the shuttle as violently as you want, because the amazing shaft, great construction and heavy head of this racket allow you to deliver unstoppable smashes. Thanks to its supreme speed and amazing power, the performance of this racket in the net play is outstanding. Net kills and net shots are delivered with plenty of power and with excellent accuracy. Yonex did an amazing job with this racket. It’s fast, powerful and very maneuverable. Is this racquet good in Defense ?